The New VI Box is the most innovative, affordable, portable, easy to use, and versatile wet lab box on the market. When used with the LifeLike Embedded Femoral Arteries, Embedded Veins or Embedded Carotid Arteries Pad, you can now train on ultrasound, dissection, and vessel exposure. 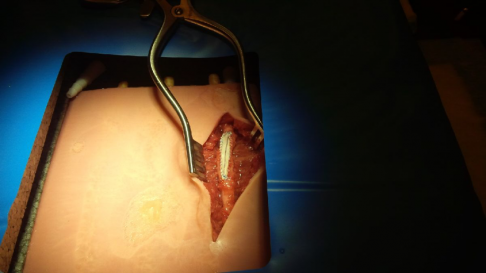 Also train any vascular surgical skill, such as end-to-end or end-to-side anastomosis with a saphenous vein, femoral endarterectomy, carotid endarterectomy and repair, as well as femoral cannulation while using the pump to check for the quality of the repair. Repair the surrounding tissue and skin layer for a complete training experience. Its lightweight and battery charge attributes allows for easy training at the hospital while on call, at home, at a conference or at the Surgical Simulation Centre. The pulsatile flow pump (used for arteries) and continuous flow pump (used for veins) will increase the fidelity of the training and help evaluate the quality of the anastomosis and procedure. 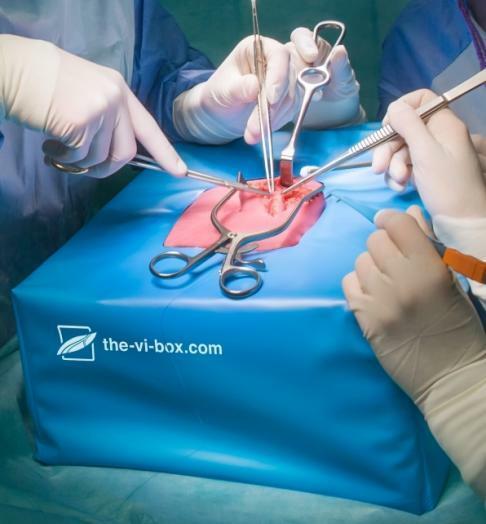 The VI Box can be used with the LifeLike Embedded Veins, Embedded Femoral Arteries or Embedded Carotid Arteries Pad, or with any of the LifeLike or silicone Femoral or Carotid Arteries of your choice. Ready to Use Anywhere: Hospital, Home or Training Facility. Ideal for the Repetitive Training, Maintenance and Evaluation of Basic Open Surgical Skills. Clamp the Femoral Artery, add an incision and suture the Femoral Artery to another Artery end-to-end anastomosis. Repair the surrounding tissue and skin layer for a complete training experience. Clamp the Carotid Artery, add an incision and remove plaque and repair. Blue surgical cover for box. Power bank to be connected for use. Black foam to secure the tissues. One side to secure Femoral Artery and another side to secure single Carotid Artery or Tissue Pad. Pads of different thickness to adjust the tissue depth. Pump steering unit with a red marked USB slot to control pulsatile or continuous flow. 2 pumps in the bottom of the box a blue one for continuous flow (used for veins) and a red one for pulsatile flow (used for arteries). 2 connectors to connect the tissues Carotid Artery and Femoral Artery. A plastic tray to hold tissues, instruments and sutures during training. Adjustable platform to adjust depth. Interchangeable components to set up the Carotid Artery, the Large Femoral Artery, the Embedded Carotid Arteries, the Embedded Veins, or the Embedded Femoral Arteries Pad. Easy to set up, easy to transport, easy to clean and store. VI Box and Tissues $1150. Complete VI Box with Instruments and Tissues $1650. VI Box with 1 Embedded Femoral Arteries Model, 1 Embedded Carotid Arteries Model, 2 Large Saphenous Veins, 2 Boxes of Nylon Suture C, and 1 Suturing Instruments Kit (includes Metzenbaum Scissors, Cooley Forceps, Castrviejo Neddle Holder, Crile Forceps, Potts-Smith Scissors, Weitlander Self Retainer Retractor and Scalpel Handle).